Intel's recently introduced Atom chips code-named Bay Trail will be in 10 tablets and hybrids by the end of November, when the U.S. holiday shopping season takes off. That's less than Intel hoped for, but it is faster adoption for Atom chips in tablets than for their predecessors, said Brian Krzanich, Intel's CEO, during a call on Tuesday to discuss third-quarter earnings. "We've seen 50 design wins with half of them being 2-in-1 devices," Krzanich said. "We see it continuing to grow as we enter next year." Intel is using the term "2-in-1" to describe hybrids, which can function as both tablets and laptops. Detachable keyboards can be attached to turn tablets into laptops. The first Bay Trail tablets that have already been announced run on Windows 8.1 and start at $299. But there will be new tablets running on Android by Thanksgiving weekend, Krzanich said. Intel has projected Bay Trail tablets with Android to start as low as $150. Windows-based Bay Trail tablets have already been announced by Dell, Toshiba, Asustek Computer, and Hewlett-Packard. 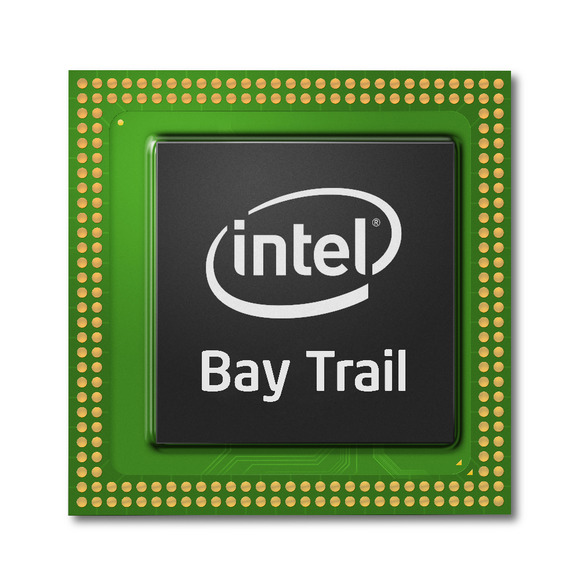 Bay Trail chips are expected to provide more than eight hours of battery life. The chips are capable of better graphics than previous chips code-named Clover Trail. The first Bay Trail tablets will have only 32-bit versions of Windows 8.1. The first 64-bit tablets will come in the first quarter of next year, Intel has said. Krzanich recognized the importance of the tablet market and said the company needs to accelerate growth in the area as PC shipments slump. Intel is also trying to push its fourth-generation Core processors code-named Haswell into tablets and hybrids. Microsoft's Surface Pro 2 tablet, which ships on Oct. 21, runs on the Haswell processor.